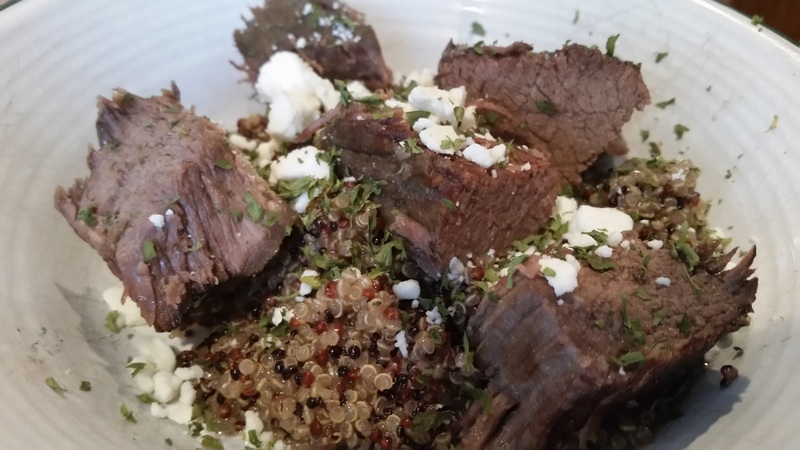 Slow Cooker Beef Quinoa Bowl with Red Wine Sauce – What's for Dinner Moms? This recipe was totally made up on the spot. I am trying to get through the end of the month with buying as little as possible. We were out of chicken and beef stock so I didn’t want to go buy more. What works instead? Wine! Yes, I have extra wine on hand. Doesn’t everyone. I heard words like heavenly and food made by God from my kids when they were eating this. They absolutely loved it and didn’t leave a single bite. They said it was better than restaurant food. Highest compliments in their realm. The wine added tons of flavor and the feta added a hint of saltiness that balanced it out. Next time I plan on adding vegetables to the dish such as sliced onions, mushrooms and possibly some red peppers. Serve this with a vegetable and a spinach salad to complete the meal. Salt and pepper the steak well. Place in the bottom of the slow cooker. Pour wine over steak. Add garlic and thyme to slow cooker. Cook on low for 6-8 hours until steak reaches desired doneness and is tender. Remove steak from slow cooker and pour liquid into a saucepan. Remove 2 cups of liquid for cooking the quinoa and cook the rest over medium heat to a simmer until it reduces. When making the quinoa substitute 2 cups of the liquid in the box directions for 2 cups of the red wine sauce. For the balance use water. 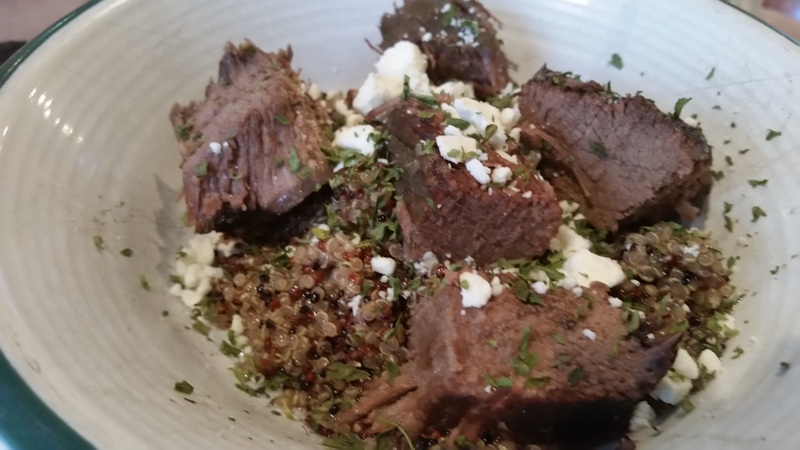 Once quinoa is cooked add to a bowl, top with sliced steak, red wine sauce and a sprinkle of feta cheese. Serve hot. Previous Post Thank You to Each and Everyone of You! Oh my goodness this sounds divine !!! Thank you, Lynn! Hope you are snuggling that little girl! I am home now and catching up on sleep, the housework and blogging! This sounds not only delicious but also very healthy! Great, Marci! Thank you, Erika. Trying to sneak a bit of healthy in from time to time.